In this brave new digital world, ERP is no longer an island. Digital transformation is about enabling business processes for the digital economy while making them accessible, efficient and effective. The speed of change driven by digitalization means that business processes, including those implemented by ERP systems, need to be agile – changing with evolving business context and responding to existing and emerging competition. ERPs must now interact with many other systems, usually by providing core business data or business processes to systems of differentiation or innovation. The increased connectivity of ERP systems lowers the level of certainty for ERP applications, and requires increased agility and adaptiveness to change. Facilitating change is one of the most difficult tasks for large-scale business processes. 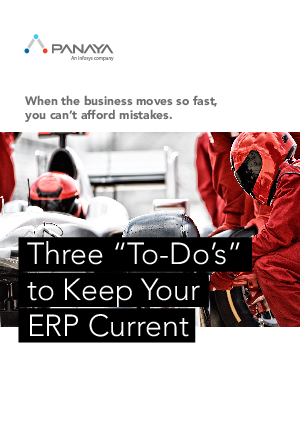 This Panaya whitepaper provides a practical "to-do" list that can help facilitate change and keep your ERP current, by exploring topics such as avoiding technical debt, handling a continuous flow of small changes in the ERP system, and dealing with “dead” custom code.